Summer events you won’t want to miss! The 35th Annual Lauderdale County Tomato Festival on July 13 and 14 will highlight the best tomato growers (and eaters) in the United States. The festival begins with the Chamber Coffee at 7:30 a.m. Friday at the Ripley Fitness Center. Opening ceremonies are at 10 a.m. in City Park. Other activities include the Saturday Salad, the Tomato Contest, an art exhibit, a 5K run/walk, an action pistol shooting contest, a baby crawling contest, Tennessee T’s exhibit, a car and bike show, a benefit bike ride, the Methodist Market and a Tomato Festival Idol Competition. Bands headline Friday and Saturday nights. The pre-event concert by Dr. Zarr and the Funk Monsters is July 12 in Ripley Court Square. Preheat oven 350 degrees. Heat oil over medium heat. Add onions, salt and pepper. Cook slowly to caramelize the onions (about 10 minutes). Add thyme and garlic. Cook another 30 seconds. Put tomatoes, onions and flour in a large casserole dish and mix to combine. Bake 20 minutes. Take out of oven and place biscuits on top of tomatoes. Brush top of biscuits with melted butter, sprinkle with cheese and chives. Bake 25 minutes or until biscuits are cooked and tomatoes are bursting. Mix together; it’s ready to serve. Wings Over Halls returns to the Halls air base on Saturday, Aug. 11. More than 30 different aircraft will perform. The event includes food vendors, flights for purchase on a variety of aircraft, military vehicles on display, re-enactors, novelty vendors, t-shirts and pedal planes for children. War birds include the B-17, P-51, T-6, BT-13, CJ-6, T-34, P-47, Steerman Trainer, Corsair, T-28 and P-63. Other aircraft in the show include the RV team, 330 Extra and Cessna 180. Gates open at 10 a.m. “Come early and enjoy the excitement of WWII brought back to Halls, Tennessee, for the day,” said Nancy Holman, event coordinator. For more information about the event and plane rides or to buy advance tickets, call the Halls Veterans Museum at 731-836-7400 or visit www.dyaab.us. 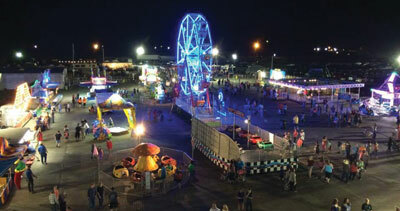 For three days as summer ends, the Lauderdale County Fair salutes the area’s rural heritage and provides plenty of activities for the whole family. Events include a petting zoo, kid’s zone, pony rides, livestock shows, a mini tractor pull, beauty pageants, exhibits, contests, a 5K run, a barbecue cookoff, the Chamber Coffee, educational workshops, carnival rides, entertainment and more. New this year will be the Torres Family Circus. The event, which is Aug. 30 to Sept. 1, will be at the fairgrounds in Halls. Admission is free. For more information, visit the Lauderdale County Tennessee page on Facebook.